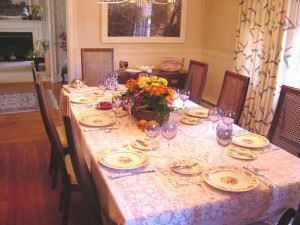 The magic number for dinner party guests is eight. The fun of a dinner party is injecting new “blood” into a familiar group. That’s why it’s always nice to mix things up and add someone to the rotation that is a stranger to some of the other guests. Yes, you can use a dinner party as the perfect cover for your matchmaking scheme, but you want to make sure it’s a good match before throwing two people together. Picking the right guests also means having everyone on the same dietary page. This will require a little investigative work on your part. You wouldn’t want to serve a delicious rack of lamb to someone who is a vegan. A great dinner party will have a featured cocktail. This should be a drink that mixes well with your dinner menu and isn’t too strong. The best featured cocktail is something that can be made in advance in a pitcher for easy serving. In fact, you shouldn’t be mixing drinks. If you have a co-host, let them manage the bar or set up a bar station on a side table and let your guests figure things out. You don’t want overload your guests with too many snacks before the main course. The go-to item is a nice cheese plate. The best approach is to keep it simple. That means buying hors d’oeuvres that aren’t labor intensive. Along with the simple hors d’oeuvres, plan a simple menu. This is where your planning skills will come into play. Your main course should be something that you can pop in the oven and let your ingredients to the work. Anything that requires a lot of attention will keep you anchored to the stove. If you’re making a salad, chop up all the ingredients before the party for a last minute toss. There is nothing wrong with having your guests “work” for their supper. If someone offers to help clean up afterwards, then let them. Better yet, if someone offers to bring the perfect dessert, welcome it with open arms. Just because you’re throwing the party doesn’t mean you have to do all the work. You don’t want to spend the day of your dinner party scrambling to clean your house. That’s why you should dedicate some time on the day before to straighten things up. This might also be the perfect time to bring in Junk King Portland. These are the junk removal professionals who can clear way all kinds of unwanted clutter throughout your home. Guests will go snooping and you don’t want them to stumble into a rubbish filled garage or spare room. Junk King Portland can make that all disappear in a single session. Make sure your next in a party is a smashing success by hiring Junk King Portland first to clear out the clutter. This entry was posted in Portland junk removal and tagged clutter, dinner party, junk King Portland, rubbish on June 28, 2017 by Junk King. Last updated June 28, 2017 .